to see our newest books! Want to submit a book review? ​that you would like to see in our Library! Can't get to the Library to check out a book? Let the Library come to you with an eBook! Use ImageQuest for copyright-free images! ​Remember to give credit to Britannica. Material labeled as 'copyright free' automatically gives you permission to use it. 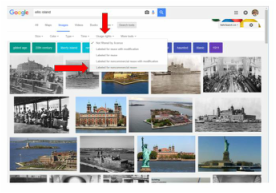 ​Your mcps account is set to automatically give you copyright free images if you are logged in on your Chromebook. 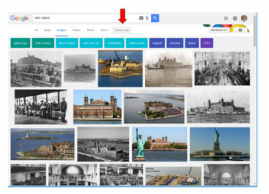 ​In Google, search for your topic, click on "Images" and then click on the "Search Tools" button. "Usage Rights" from the new menu that opens and check "Labeled for noncommercial reuse." You have permission to use any of the images that then appear. You still need to give credit to the source of the images. is (even) easier with the EasyBib extension for Chrome! Below is just some of what we've been up to in the Library! "Think Outside to Get Inside!" ​We're using breakout boxes to learn about Internet Safety! ​Did your group break out?!?! ​this year! She was everywhere! Anti-Censorship PSAs from Mr. Quesenberry's English 8 classes! Watch and Learn! Standing Up and Speaking Out against censorship in recognition of Banned Books week! ​during our after school Board Game Club! Welcome to our 2015-16 Library! From December 7-11, join us for our Book Fair AND take part in the Hour of Code to try your hand at computer programming! ​Book Fair hours are 7:25 am to 3:30 pm daily and Wednesday evening from 6:00 to 8:00 pm along with our Art Show! 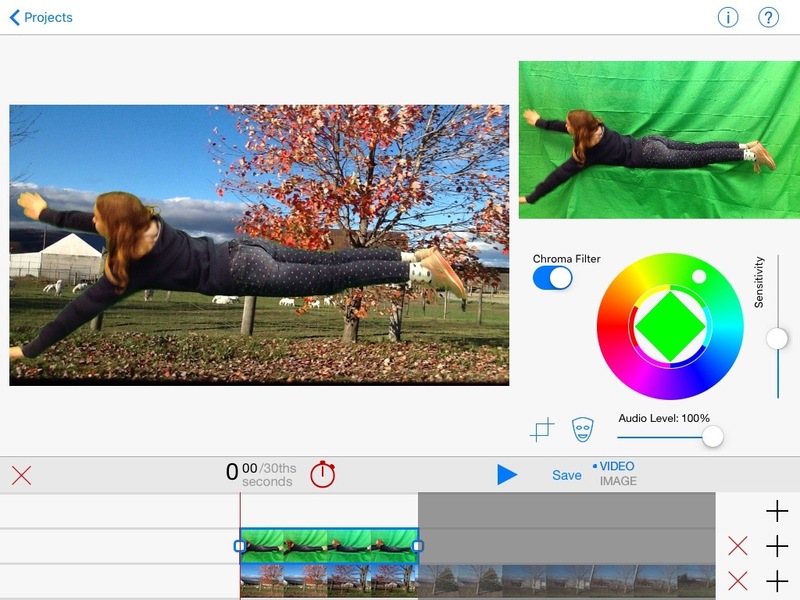 Mrs. Bonds' Social Studies 7 classes were first up to create projects using the Green Screen! ​They created amazing videos about possible causes of the Spanish-American War. Our Green Screen is here! Did you meet Harriet, the Found Art Cow? Starting with a recycled oil drum, Art students from BHS, CHS, our own Lauren C! and BHS teacher Mr. Collver welded and painted an amazing sculpture for an exhibit at the Hahn Horticulture Gardens. Harriet stopped by the Library to visit for a bit on her way to greener pastures in Ellett Valley. ​Raising awareness of censorship through celebrations of our freedom to READ! English 6 classes created Banned Book Trading Cards to highlight positive themes of books that have been banned or challenged in other communities across our Nation. ​a POETRY SLAM to perform their found poems speaking out against censors. In preparation for the Peanuts movie, our Creative Writing students recreated familiar scenes and put themselves into the picture. Do you recognize any of us? ​When we use our Library, we use ALL of our Library! ​Mr. Freeman's Science 6 students are tracing contour lines to learn about topographic maps. We welcomed our rising 6th graders with something new this year: A virtual tour of the Library using Augmented Reality! 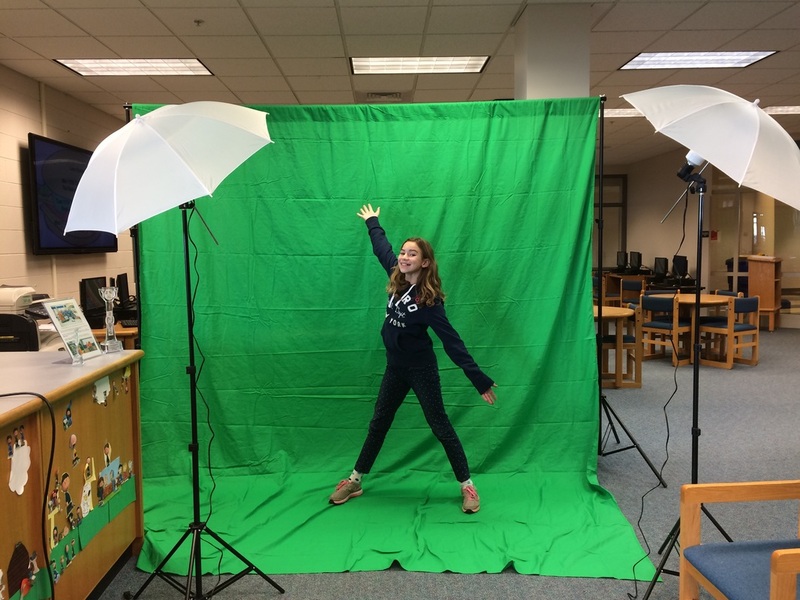 Created by Oh Snap, our FLL Lego League Team, photos came alive with videos showing all that our Library has to offer! Welcome to our 2014-15 Library! Come in and create your own! ﻿Celebrating our Library during National Library Week! Mr. Quesenberry's English 8 classes put their own spin on the Marshmallow Peep Diorama contest from the Washington Post. In honor of National Library Week, they created book themed dioramas using peeps as the characters! Hula Hoops and Dancing make for excellent National Library Week festivities! "SHELFIES" are back by popular demand! Tell what you love most about our Library and preserve it with a photo! Come in and see more photos of imaginations at work! created by Mr. Freeman's Science 6 classes! Come view them as they orbit the Library. Learn about WWI from Mrs. Fox's Social Studies 7 classes. They've set up a WWI Museum in the Library to showcase their research and to teach us more about this time period. Thank you for supporting our Library during the BOOK FAIR! And a huge thank you to our awesome helpers! Congratulations to the awesome readers in Ms Chittum's English 6 classes! They've completed the Virginia Readers' Choice challenge and cast votes for their favorite. Our winner was One For The Murphys by Lynda Mullaly Hunt, with Spy School by Stuart Gibbs as the runner up. We've been busy with English class projects that encourage others to read great books! Ms Chittum's classes created Stop Motion Animation films and Mrs. Ayers' classes created avatars of their favorite characters. We enjoyed viewing the projects on our new TV! through the efforts of our Creative Writing students and Art Teacher Ms Linda Hinson! You never know who you'll catch reading at the BMS Library! Thanks to Ms Olin for encouraging ALL to read! The Making of The Grinch! Our Creative Writing students created an augmented reality version of Dr. Seuss' How The Grinch Stole Christmas. Borrow an iPad to watch and listen! Second Annual BMS Gingerbread Creation Contest! Thanks to all who participated. Are you familiar with Augmented Reality? It's when technology is used to supplement what you see in real life with video, audio and other computer-generated m﻿aterial. Our Lego League Team has been working on a project to base our Library Orientation in Augmented Reality. Come in and Ask to try it out! Use an iPad to scan a 'Hot Spot' and see what pops up! Lego League teams Oh Snap and Hybrid Geckos engaged in some team-building activities prior to heading to the State Competition. Our own Sergeant Hayes was more than happy to test the stability of their towers! Mrs. Ayers' English 6 classes are hard at work on their First Americans novel unit projects. Click on the Reading Recommendations tab to see their book trailers. Thanks to Mr. Trujillo and the A Day Creative Writers for creating and decorating our Library Book Tree! What's happening in the Library?!? We thought we'd have some fun while waiting for our new TV to be installed. Thanks to Ms Eyre's Agriscience students for their amazing art work! How would you title an all black or all white canvas? Our Creative Writing class took on the challenge and came up with some excellent ones! "Black Bear in a Cave"
"The White Side of the Moon"
"Snow Fox on a Pillow"
Mrs. Ayers' and Ms Chittum's English 6 classes are talking about CENSORSHIP and its impact on our 'fREADom to READ!' and Mr. Q's English 8 classes are defending challenged books. Watch this video by Dav Pilkey, creator of the Captain Underpants series, to learn how ONE SIMPLE CHANGE can combat censorship! I was thrilled to be able to attend the National Book Festival in Washington, DC at the end of August. My Librarian friend from Fairfax County and I heard many amazing authors speak about what they love to do: Write books for you! Below you can listen to the webcast of Raina Telgemeier's address! And click HERE to see her webcomics! Welcome to our 2013-14 Library! CELEBRATING National Library Week 2013! Thanks to Mr. Trujillo for helping us kick off the week with a Library Dance Party! Showing our Library Love with "Shelifies," hula hoops, Chalk Art and Library BINGO! to the students in Ms Chittum's English classes that completed the Virginia Readers' Choice Challenge! These students read the nominees and cast their vote for their favorite. BMS Winner: The False Prince by Jennifer Nielsen! The Strange Case of Origami Yoda author Tom Angelberger for visiting our Guys Read Book Club! Stop Motion Animation with Ms Chittum's 6th Grade English classes. Above are five different versions of a scene from the same book. Can you name the book? Click on the Reading Recommendations tab above to view some of them. The Library hosted the Book Trailer Oscars to celebrate the book trailers created by students in Ms Sim's English classes. Click on the Reading Recommendations tab to view some of them. The Selection and The Elite! New BOOKS have arrived! We've recently received over 120 new books! Come check out some great titles! Not even the Library was immune to the antics of the BMS Mischief Elf! to our amazing Library volunteers! I have had many wonderfully dedicated parents and community members volunteering to help complete our move back to Blacksburg. I appreciate you so much!